I am pleasantly surprised with RBI Baseball 2016. First off there is a physical copy of this game, and it is solid, decent baseball action for families. The options and menu screens are very minimalist. RBI Baseball 2016 also costs one third of what MLB 16 The Show came out for. Trying to calculate that out? 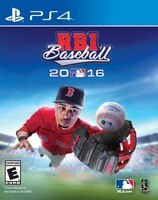 RBI Baseball 2016 sells for under twenty dollars. I am thankful Family Friendly Gaming purchased it since the PR & Marketing for RBI Baseball 2016 were not competent to reply to any inquires from FFG. The default fielding is tough. I recommend families swap over to the assisted. Players will make errors in RBI Baseball 2016. Also do not try to throw to first base without the first baseman standing on first. He throws the ball away. There are also some odd graphical glitches here and there in RBI Baseball 2016. The baseball parks look nice, and the players look decent. Again not as good as MLB The Show. Pitching seems limited at first. That was until I read the controls and messed around. We move the pitcher left and right on the mound. We then press up for a change up, and down for a fast ball. Once the pitcher throws the ball, we can press right and/or left to curve the ball around. This sets us up for some really cool strategies. Like lining up the pitcher with the batter and then curving the ball away from them. I am being lenient on RBI Baseball 2016 because I do not expect it to compete with a simulation like MLB 16 The Show. RBI Baseball 2016 is not at the level of an arcade game, but it does not contain all the simulation elements either. What do I mean by that? There are not exaggerated hits or pitches in RBI Baseball 2016 like there is in say The Bigs for instance. I hope this franchise continues for many years. RBI Baseball 2016 is bare bones in what we can do. Play in a Exhibition, Season, Post Season or Online. RBI Baseball 2016 also lets us manage the rosters, and check scores online. The default ball indicator needed to be changed as well. I had fun playing RBI Baseball 2016 on the Playstation 4. Definitely got twenty dollars out of it.